How Would You Like Your Hot Dog — New York, or Columbian Style? In these dog days of summer, thoughts turn to hot dogs. The all-American food, right? Well, just like nearly every other aspect of our culture, what you put on a hot dog reflects where you come from. Luis Echeverry came to the U.S. from Colombia, South America, spending formative teen years in New York City. He moved down to the Charlotte area to work for the phone company. 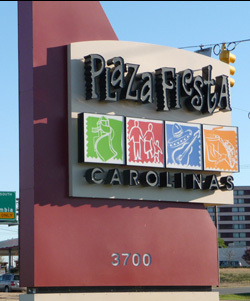 On the side he runs a hot dog cart at Plaza Fiesta, the exciting Latino-themed mall next to Carowinds. But his eyes light up if you ask for your hot dog as it’s traditionally done down in Colombia. Watch close — it’s an amazing production. First into the bun go potato chips. Then the hot dog itself. Then crushed pineapple. Crumbled white taco cheese. A squirt-line of mustard. A squirt-line of honey. A squirt-line of mayonnaise. A squirt-line of salsa rosada, the mild pink sauce beloved in Colombia. Sadly, the hot dog cart and Plaza Fiesta mall are gone.